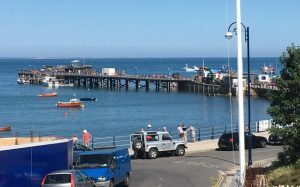 If I was a gambling man I'd be tempted to bet that more new divers took their first sea dive under Swanage Pier than at any other site in the UK. I would also bet that many of them, no matter how long they have been diving for, still like a dip there. The secret to getting a great dive day at Swanage is to bag a parking place on the pier. This can be easier said than done at weekends when conditions are good in summer. Then you need to be there well before the pier opens but in the week and away from the summer holidays things are far more peaceful. Even if you can't get a coveted pier parking spot don't worry. Unload by the pier gate and leave a kit minder while the driver parks at the long stay car park just a few yards up the hill behind the pier. Currently, parking costs £9 to stay all day and divers are charged £2.50 each. This charge is waived if you are diving from a boat leaving the pier. The pier trust kindly provides plenty of trolleys for diver use so just grab one or these and use it to shift your kit to wherever you base yourself. Anyone who knows me or reads my blogs knows that dining opportunities are a key feature of my dive planning. No problems here, there are great breakfast, lunch and dinner options within a very short stroll of the pier. As I write this the pier is completing an extensive renovation programme and I understand the new, on-pier, "1859 Pier Cafe & Bistro" is now open. No need to bring a packed lunch to Swanage! This is a shallow dive and at high tide, you are unlikely to get below 5m or so even out at the far end of the pier. Conditions here are pretty good for most of the time. The wind direction that can ruin the visibility and bring in the waves is an easterly. I'm a fan of XCWeather for keeping an eye on wind direction and strength when planning a dive. Swanage Bay does have quite a bit of silt on the bottom so after a period of bad weather it can take a day or two for conditions to pick up. The easiest option for getting in is down the steps just by the gents toilet! Watch out, they can be slippy. There is enough depth by the steps when the tide is up but at low tide you need to take some precarious steps across the stones to find enough depth to swim in. Once in, its an easy and short swim to the pier itself. I have never felt any current here so your dive should be nice and gentle... I have absolutely no issues with easy, chilled diving. Navigation is dead easy. If its dark up top and there are pier pilings on each side you are under the pier. If not - you aren't. Just follow the pier out and then when your turn point is reached turn around and come back. When you hit a wall the dive is over. This is a dive about the little stuff. Look out for nudibranchs, juvenile fish, pipefish, small flatfish, crabs and lobsters. Bass, mullet, John Dory and shoals of sandeels are regular visitors. 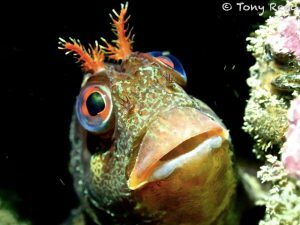 Do look out for the delightful Tompot Blennies which always remind those of more senior years of Denis Healey. There are also the inevitable resident wrasse - I remember a small but feisty territorial cuckoo wrasse making it very clear that I should depart their territory post haste! If you are a fan of close up and macro photography this is a dream location. Two companies operate from the pier. Divers Down is one of the oldest dive stores and training centres in the UK, dating back to 1958. They operate a compressor offering air and nitrox fills and have a store in case you forgot anything. Divers Down operate two dive boats and visit all the local and sometimes not so local dive sites. They keep an up to date list of trips with vacancies. They also post last minute places on a board outside the shop so you might be lucky if you just turn up in the morning. Many of their trips are shuttles - they accept bookings from buddy pairs, no need to fill the boat and simply take you out for a single dive and bring you back. You can organise your day as you wish, maybe combining a dip under the pier with one or more boat trips during the day. Swanage Boat Charters offer a similar service. 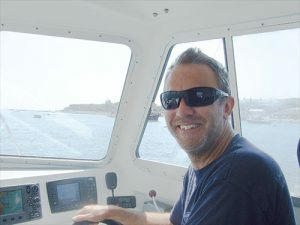 They too run two boats with one tending to do charters or shuttles to more distant sites while Mary Jo, generally skippered by the unflappable and helpful, Bryan, covers more local sites. 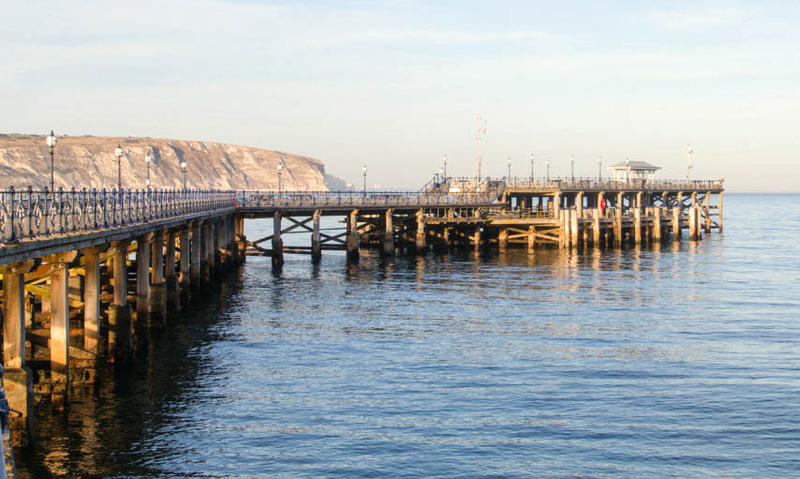 Swanage Boat Charters have a very useful website where, once you are registered, allows you to see all their trips for the whole season and book online. 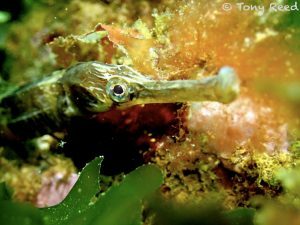 Boat dives tend to be to local wrecks at slack water with a number of options for thrilling drift dives when the tide is running. Don't miss the opportunity to drift from Old Harry Rocks or across the Peverell Ledges. The wrecks are many and various. Open Water divers will love the Fleur de Lys, a wreck of a trawler which sank in 1969 and which sits in 13-15m of water. I love taking a trip to the Valentine Tanks; amphibious tanks which sank (who'd have thought that could happen!) during trials before D-Day. There are two tanks linked by a line making navigation between them easy - although I know a diver who managed to get lost here ;-) They contain a prodigious amount of life far out of proportion to their size. Expect lobsters, edible crabs, conger eels, big shoals of pout and pollack. I am lucky in that I can get to Swanage for a day's diving and still be home at a civilised time but I still try to build in at least a couple of weekend trips down here. There is plenty of accommodation from campsites, self catering and a whole range of hotels and plenty of great eateris and pubs for post diving entertainment. 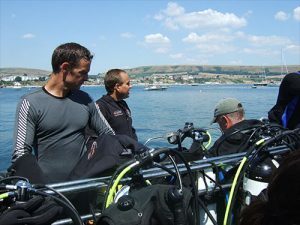 Why not visit Swanage for a dive or two? As long as the winds aren't the dreaded Easterlies you won't regret it.